I was at the Landmark toy store last week just checking out what kind of new toys there are in the market so I would have an idea of what to give some of my godchildren for Christmas. As I was walking around, I found this pack of plastic dinosaurs for kids. 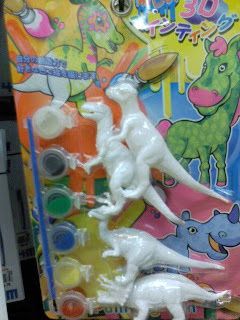 It's a set of white dinosaurs complete with water-based paint so kids can paint them. I took the item off the rack and flipped it to check the price. When I placed it back on the rack, it suddenly startled me. The two T-Rex dinosaurs were closely packed together that it looked like one was mounted on the other. Oh my ! I wish they'd take a better look at how it was packaged to make sure no kid would think otherwise.